Above freezing temperatures day and night have softened the snowpack as result of free water perculating down. Ski, boot, and snowmobile penetration is common and often deep. Loose wet debris fields are common on solar aspects and relatively high elevations. Travel on these slopes is NOT recommended once significant solar heating has started. The lower reaches of our snowpack involve the Thanksgiving rain crust and several other deeply buried crusts. These sit atop a loosely consolidated layer of large faceted crystals. I observed one deep slab release this weekend on a steep south aspect at Turner Mountain Ski Area. The slab scoured to the ground (beargrass) and deposited all debris on flat bench associated with the boundary run. No snow was left on the slope after this release. Our weather pattern has transitioned from warm/wet to warm/dry. Mountain temperatures are not allowing overnight freezing and quickly move into the 40s by mid-late morning. Hazard is CONSIDERABLE as the day progresses as free water is moving through the snowpack. 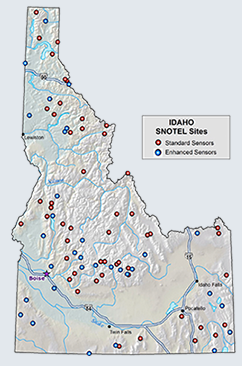 All SNOTEL sites are showing SWE drainage from the snowpack. Today I traveled on a shaded north aspect and encountered an easily breakable crust. Once I broke this crust, I plunged with boot or ski deep into the snowpack. I was able to leave the area by mid day, but the temperatures had already reached the mid-40s. The only real mitigation for these type of snowpack conditions is to stay off of steep solar slopes, and out from under any steep slopes. It is hard to control our decision making processes when the weather is so nice and the mountains are so beautiful. Please be patient and wait for some solid overnight freezing temperatures to provide a good opportunity for safe back counrty travel. Today I visited Snowshoe Basin (SnowshoePeak 8734) in the East Cabinet Range. At 5500' elevation I found 45 inches of snowpack on a steep north aspect. The top 3 inches was a pencil hard melt-freeze crust. Below this is a 12 inch layer that is 4 finger soft as a result of chronic above freezing temperatures. Below this layer is a 10 inch 1 finger hard layer. The Thanksgiving rain crust (5 inch thick) has softened to pencil hardeness. Below the rain crust is a 8 inch 1 finger hard layer on top of another 2 inch pencil hard crust. The bottom 5 inches is a soft, unconsolidated layer. Extended Column Tests yielded partial propagation below the surface crust with 10 wrist taps. (blue card marks failing layer) . Further testing (ECT) yielded a Quality 2 shear at the ground with FULL propagation (ECTP 18). Grains at this failure were +4 mm facets. Since the Friday, January 23rd advisory, weather in the Kootenai Region has been warm and wet. All SNOTEL sites are reporting above freezing temperatures for the period with 40s F on Sunday and Monday. The Bear Mountain and Poorman Creek sites show SWE increases of 0.6-0.7 inches and drainage from the snowpack as well. 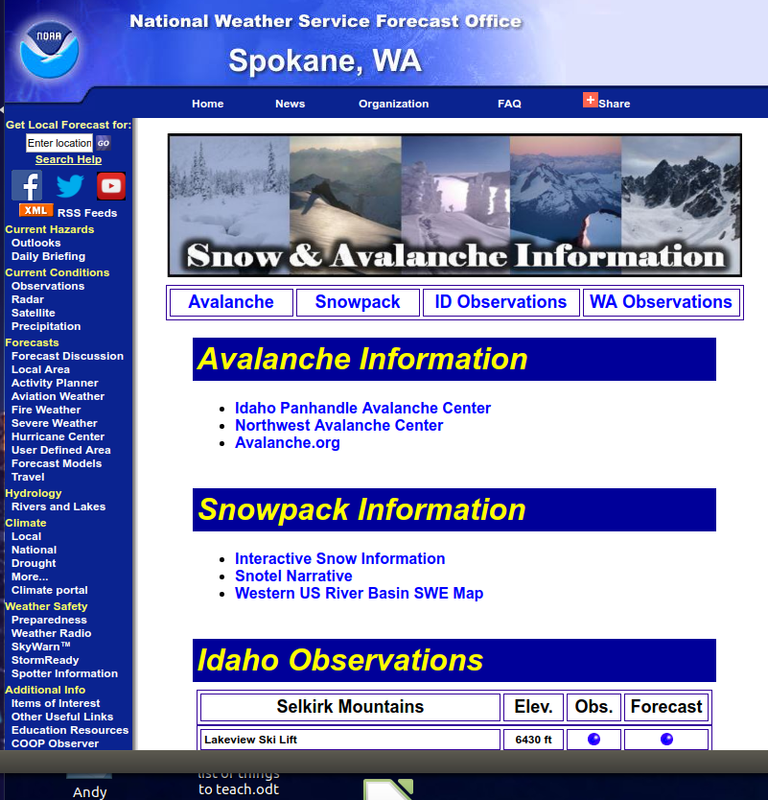 All sites show settlement of the snowpack from 3-7 inches. Weather today in Snowshoe Basin of the East Cabinet Range at 5500 feet elevation was clear, calm, 40º F at 1030 hours, and no new snow. Forecasted weather is for 25-45% cloud cover, above freezing temperatures day and night with mid 40s common during the day, and southwest winds of 10-12 mph. No snow or rain is in the forecast.